How to decrease CPU power consumption while it is operating ? What is the maximum power a CPU consume ? How to programmatically request a lower-power C-state ? What triggers a CPU core to enter Cx-state ? Is it possible to disable C-states (so always C0 is used) ? How does an interrupt affect the processor/core in a sleeping state ? Does the information about C-states and P-states above applies to mobile/laptop processors or embedded/phone processors ? How does all these actually work, for example in Linux ? How can I monitor my CPU ? How does CPU save power ? 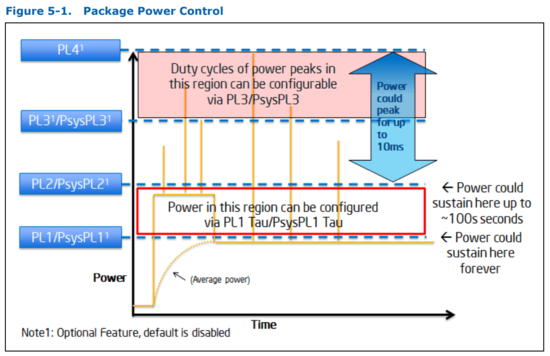 You will learn all the basics about the CPU power management in this post. The processor/CPU is designed to operate forever under a specific load. As almost none of us are doing a 24x7 calculation employing all the resources of the CPU continuously, it is most of the time not operating in its designed maximum. So what is the point of keeping the whole CPU powered on at its full capacity ? This is the point of CPU power management. The power management topic covers much more than this, including the RAM, GPU etc., but I am going to tell you only about the CPU side of the story in this post. If you know about C-states and P-states and how CPU enters to and exits from these states, probably there is nothing new in this post for you. If not, continue reading. I was planning to include a few real-world examples from Linux, but the post was getting longer and taking even more time to finish, so I will do that in another post. The general information in this post is applicable to all modern CPUs but the details can be very specific to the individual CPU (esp. to the processor family) and I am using an Intel® Xeon® E3-1245 v5 @ 3.50GHz, this is a Xeon E3–1200 v5 series (formerly Skylake) processor (model number 0x5e). Unless otherwise noted, all original figures and tables are from the datasheet. 2019/03/01: Added CoreFreq output to last section. You will learn what both of these descriptions mean throughout this post. The first one is simple to understand, if you shut down the power, you do not consume any power. The second requires a bit more explanation. The power consumption of an integrated circuit (such as a processor) is proportional linearly to frequency and quadratically to voltage. On an active CPU, Pdynamic is the most important part, it is the part I mention here, being proportional to the frequency and quadratically to the voltage. Psc=Pshort-circuit is proportional to the frequency. Pleak is proportional to the voltage. Higher (serial) performance requires both higher frequency and higher voltage, thus having even a larger effect on the power consumption. This depends a lot on the processor but E3–1245 v5 @ 3.50 Ghz has Thermal Design Power (TDP) of 80 Watts. This is an average value the CPU can sustain forever (Power Limit/PL1 in the figure below) and it is usually the value that the cooling solutions should be designed at for reliability. Actual power CPU consumes can temporarily go higher (as shown as PL2, PL3 and PL4 in the figure below). TDP is measured under a high-complexity (~worst case) load with all cores active at the base frequency (of 3.50 Ghz). You can see in the figure above that the CPU can consume more power than TDP at PL2 for up to 100 seconds, that is actually quite a long duration. C-states describe the first case, so they are the idle (power saving) states. In order to power down a subsystem, that subsystem should not be running anything, so it should be at idle, doing nothing, executing nothing. So C-state x, Cx, means one or more subsystems of the CPU is at idle, powered down. On the other hand, P-states describe the second case, so they are the executing (power saving) states. The subsystem is actually running but it does not require full performance so the voltage and/or frequency it operates is decreased. So P-state x, Px, means the subsystem it refers to (e.g. a CPU core) is operating at a specific (frequency, voltage) pair. 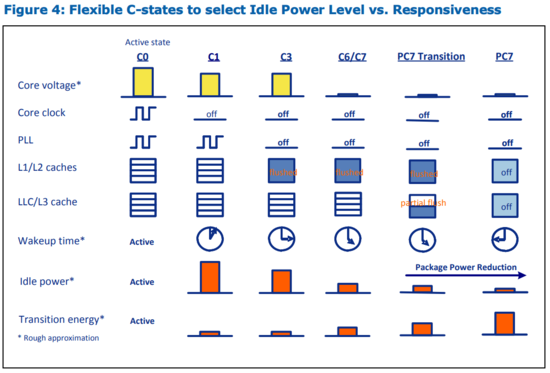 Because most modern CPUs have multiple cores in a single package, C-states are further divided into core C-states (CC-states) and package C-states (PC-states). The reason for PC-states is there are other (shared) components in the processor that can also be powered down after all cores using them are powered down (e.g. the shared cache). However, as a user or programmer, we cannot control these, since we do not interact with the package directly, but we interact with the individual cores. So we can only affect the CC-states directly, PC-states are indirectly affected based on the CC-states of the cores. The states are numbered starting from zero like C0, C1… and P0, P1… The higher the number is the more power is saved. C0 means no power saving by shutting down something, so everything is powered on. P0 means maximum performance, thus maximum frequency, voltage and power used. C0: Active, CPU/Core is executing instructions. P-states are relevant here, CPU/Core may be operating at its maximum performance (thus at P0) or at a lower performance/power (thus at anything other than P0). C1: Halt, nothing is being executed, but it can return to C0 instantenously. Since it is not working (but halted), P-states are not relevant for C1 or any Cx other than C0. C2: Stop-Clock, similar to C1 but it takes longer time to go back to C0. C3: Sleep. It can go back to C0, but it will take considerably longer time. 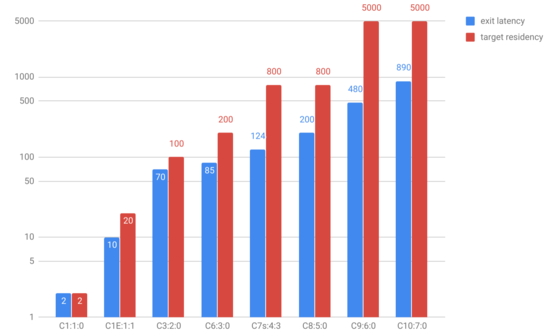 Many modern CPUs have plenty more C-states and according to its datasheet Intel® Xeon® E3-1200 v5 Family has C0, C1, C1E (C1 Enhanced), C2, C3, C6, C7 and C8. C1 and C1E are CC-states only, and C2 is only a PC-state. All others are both a CC-state and a PC-state. Note: There are also thread level C-states because of Intel Hyper-Threading. However, the individual threads can only request C-states but power saving action only takes place when the core enters to that C-state. I will in general omit talking about Thread C-states and Hyper-Threading in this post. Note: LLC above refers to Last Level Cache, meaning the shared L3 cache in the processor. The normal operation is at C0. Then, when all the cores are powered down, the shared cache (L3/LLC) of the package is flushed and at the end the package/whole CPU can be (almost) powered down. I said almost because I guess there has to be something powered on to return back to C0. Obviously, if a core is running (C0), the package cannot be in a state other than C0. On the other hand, if a core is completely powered down (C8), the package can still be at C0 if any other core is still running. Note: Intel Software Developer’s Manual mentions sub C-states, or substates, meaning a C-state (type) actually contains one or more sub C-states. After checking the intel_idle driver code in the Linux kernel, I understand for example C1 and C1E has the same state type C1, but they are subtypes 0 and 1. Also note from the Intel manual: “The definition of C0 through C7 states for MWAIT extension are processor-specific C-states, not ACPI Cstates”. So do not confuse these with the ACPI C-states I mentioned before, they are obviously related and there is a mapping between but they are not exactly same. I have created the chart below from the intel_idle driver source code for my cpu (model 0x5e). The horizontal axis labels indicate the C-state name:processor specific state:processor specific substate, and the vertical axis indicates exit latency and target residency values from the driver source code. exit_latency is used as a guidance to assess the real time latency impact of this state (e.g. how much it takes to return back from this state to C0), and target residency means the minimum duration the core has to stay in this state to overcome the enter/exit power costs. Pay attention to logarithmic scale on the vertical axis, the latency and break even power impact of deeper states are exponentially higher. Note: Although there is C9 and C10 in the table, since they have 0 substates, they are not used in my cpu. Other CPUs in the same family may support these states as well. There is also a special global state G1/S4, Non-Volatile Sleep, where the system state is saved to non-volatile storage (such as disk) and then powered off. This makes it possible to consume minimal amount of power like Soft Off state, but returning from this state to G0 is possible without restart. It is what we know as Hibernation or Suspend to Disk. GO/S0: Computer is running, not sleeping. G1/S1: Power on Suspend. The system state is preserved, so CPU and CPU Caches are still powered. G1/S2: CPU is powered off. So CPU and CPU Caches are lost. G1/S3: Standby, Sleep or Suspend to RAM (STR). System RAM remains powered. G1/S4: Hibernation or Suspend to Disk. Everthing is saved to non-volatile memory (like disk), so RAM and possibly all the system is powered off. G2/S5: Soft Off. Like mechanical off but things that can wake up the computer from power save is minimally powered. No state is saved, so a reboot is needed to go back to G0. G3: Mechanical Off. The Power Supply Unit is disconnected (e.g. via a power switch). Only the things like real-time clock (RTC) is running because they have their own small batteries. Obviously no state is saved, so a reboot is needed to go back to G0. For my CPU, see the Figure below, all of the C-states mentioned above is in ACPI G0/S0. Basically what it says is, once you go to any sleeping mode (G1), the CPU (package) is powered down. In G0/S0/C8, only the processor package is powered but all of the cores are powered down. In G1 (S3 or S4), there are no (valid) C-state (no CC no PC), because the CPU is completely powered down. For G3, there are no S-state. The system is not sleeping, it is mechnically powered down, it cannot be waken up, it has to be powered on first. The modern (but not only) way to request a low power state (thus state change from C0 to others) is to use MWAIT or HLT instructions. These are priviliged instructions, they cannot be executed by user programs. MWAIT (Monitor Wait) instructs the processor to enter an optimized state (C-state) while waiting for a write/write to a specified address range (set up by another instruction, MONITOR). For power management, MWAIT is used with EAX, and EAX[7:4] bits indicate the target C-state and EAX[3:0] indicate the sub C-state. Note: I believe at the moment only AMD has this, but there are also MONITORX/MWAITX instructions which, in addition to monitoring the write on an address-range, also checks the expiration of a timer. This is also called Timed MWAIT. HLT (Halt) instruction stops execution and the core goes to HALT state until an interrupt occurs. This means the core switches to C1 or C1E state. C0 is entered at boot, when an interrupt happens or a write event occurs on the address monitored by an MWAIT instruction. C1/C1E is entered with HLT or MWAIT instructions. C3 is entered with MWAIT instruction, then L1 and L2 caches are flushed to LLC and all core clocks are stopped. However, the core maintains its state since it is still powered. C6 is entered with MWAIT instruction, then the processor state is saved into a dedicated SRAM and the voltage to core is reduced to zero. At this state, core has no power. 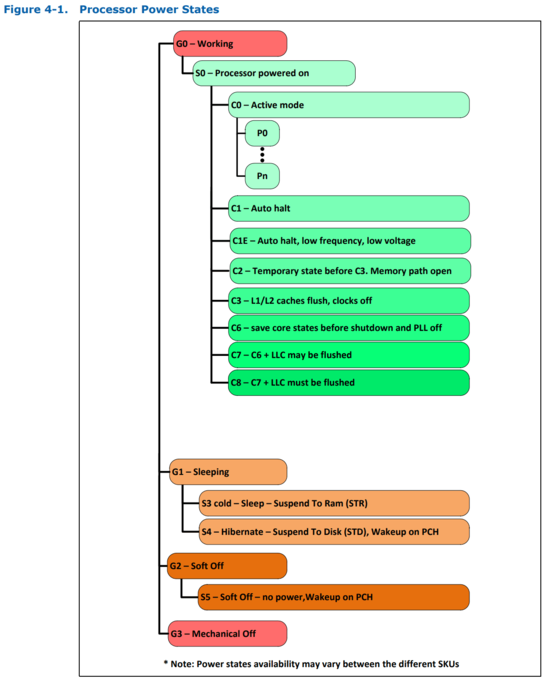 When exiting C6, the processor state is restored back from the SRAM. C7 and C8 are same as C6 for the core. Just to remind again, I omitted the hyper-threading in this answer. As I showed in the chart before, the transitions to/from the deep C-states have higher latencies and energy costs. Thus such transitions should be done carefully especially on battery powered devices. It is possible but not recommended. In the datasheet (section 4.2.2 page 64) there is this note: “Long term reliability cannot be assured unless all the Low-Power Idle States are enabled”. So you should really not disable C-states. P-states means the CPU core is also in C0 state because it has to be powered to execute a code. P-states basically allow to change the voltage and frequency (in other words operating point) of the CPU core to decrease the power consumption. There are a set of P-states which corresponds to different operating points (voltage-frequency pairs), and a P-state refers one such operating point. The highest (frequency and voltage) operating point is the maximum performance state which is P0. It is possible to use P-states in Intel Xeon E3–1200 v5 in either OS/Operating System controlled (Intel SpeedStep® Technology) or HW/Hardware controlled (Intel® Speed Shift Technology) mode. The information below about P-states is specific to Intel Xeon E3–1200 v5 Family, however, I guess it is same or similar for other modern processors. In this method, OS is aware of the P-states and a specific P-state is requested by the OS. This basically means selecting an operating frequency, whereas the voltage is automatically selected by the processor depending on the frequency and other factors. After a P-state is requested by writing it to a model specific register (meaning a 16-bit value is written to IA32_PERF_CTL), the voltage is transitioned to an automatically calculated value and the clock generator (PLL) locks to the frequency requested. All cores share the same P-state, so it is not possible to set this individually for a core. The current P-state / operating point can be read from another model specific register (IA32_PERF_STATUS). The P-state transition is rapid, so many transitions per second can be performed. This is very different than C-state transitions which have higher latency and power costs. In this method, OS is aware of the hardware support for the control P-states and it makes a request specifying only workload requirements, no specific P-state or frequency is requested. Based on the hints given by OS, and many other factors and constraints, a P-state is selected by the hardware. I am going to say more about this in another post, but just to give you an idea, my current Linux desktop operates in this mode, which I understand by checking IA32_PM_ENABLE, and the maximum (non-guaranteed) performance level is 39, and the lowest performance level is 1. This roughly means there are 39 different P-states. At the moment, 39 is requested by the OS both as minimum and maximum performance and the preference is on performance, these are all because I have disabled the dynamic CPU frequency change in the kernel. Since the TDP (thermal design power) is the maximum power CPU can sustain, when the power consumption is below this value and under certain other conditions, CPU frequency can be increased beyond base frequency (from 3.50 GHz to 3.90 GHz in this CPU) since this condition does not increase power consumption beyond TDP. Turbo Boost can also temporarily increase power consumption up to PL2/Power Limit 2 for a short period of time. The behaviour of Turbo Boost can be modified by giving hints to hardware. As an example, a recent MacBook Air processor i5–5350U has mainly all the features I described above (I am not sure about HW-controlled P-states). I also looked at ARM Cortex-A documentation, and although the terms are different, it looks like it has very similar power control mechanisms. That is going to be answered in another post, stay tuned. There are not many applications you can see these information, but you can, for example, use CoreFreq.